1. Use paperclips to keep pieces of leather held together. You cannot use pins because it will leave holes in the fabric and can damage it, but paper clips are the perfect solution. 2. Fill a pincushion with steel wool. When you put your needles in it, not only will they stay in place so you know where to find them, but it will also help sharpen your needles! 3. Use hairspray to get the tip of your thread to stay straight. 4. To mark fabric, and have a nice measuring tool, use Washi tape! It’s ¼” wide so it’s great to help you measure seams and meet lots of your sewing needs. 6. When you are sewing on buttons or embellishments, make sure you have your hair straightener handy! You can use it to press the fabric in between each button. 7. Use washers as pattern weights. 8. If you are trying to create gathers in your fabric, use the cheating method which is also known as the corded zigzag method. All you need to do is sew a large zigzag stitch over a piece or yarn and then use the yard to create a gathered look in your fabric. It’s so easy to do! Then you can use a straight stitch to sew your gathers in place and, voila! 9. Use rubber bands around the base of your sewing machine to make a seam allowance guide. 10. When you are trying to sew over lumpy fabric that is difficult to work with, put a plastic bag over the top of your fabric. You should be able to glide right over it and it will be so much easier to sew. 11. This easy DIY project for fabric weights will make your life so much easier when you are trying to pin your fabrics. You can make it out of washers and a hot glue gun, and you will definitely be glad that you did! 12. Use cardstock to create your own hemline tool. It will help you iron straight hemlines and folds perfectly every time you use it! How genius is that? 13. Add magnets to the bottom of a bowl to keep your pins and needles in place. 14. Foam toe separators used for pedicures can actually come in use in the sewing room too! You can keep your filled bobbins stored in the slots where your toes go and they will be really easy to find (and all in one place) when you need them. 15. To create your own sew-on-the-go case, store some needles, pins, and threads into a mini matchbox. 16. Don’t you hate when the threads unravel after you sew a button into place? Well, your problem can be solved with clear nail polish! 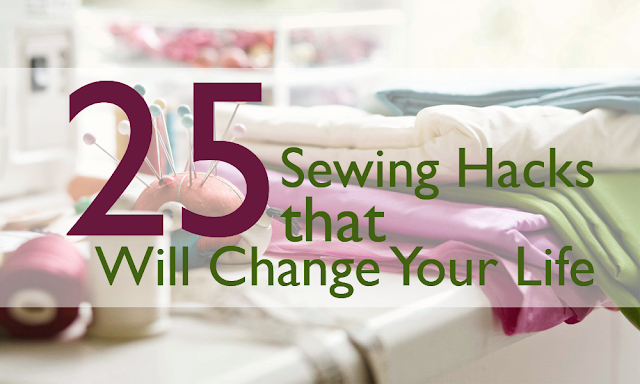 Just cover the button with a coat of clear nail polish after you sew it and it will help to hold it in place longer. 17. Tie a long string (long enough to make a long necklace) through the handles of your scissors. You can wear them around your neck so you always know where your scissors are. 18. Put a rubber band around your sewing machine paddle so that your foot won’t slip when you are using it. 19. It’s important to keep your scissors sharp, and it can make a huge difference for your sewing projects. To easily sharpen your sewing scissors, use them to cut foil. This hack is quick, easy, and really helpful! 20. To make sure your measurements are correct, attach a tape measure to the end of your table. 21. When quilting it’s always nice to have an extra set of hands, but sometimes we don’t always have that luxury. If nobody is around to help you, you can use binder clips in their place! They will hold your binding in place while you quilt and are also good for making a quilt sandwich. 22. To make sure you don’t go too far, you can slide a pin across the end of a buttonhole before you ripe the stitches. 23. If you are making a quilt, find some of your old blankets you can use. They are great for batting that you can put inside your quilt! 24. When you have dull straight pins that are difficult to work with, try putting them in a piece of bar soap and then they will go through your fabric a lot easier. 25. When you need a seam allowance, all you have to do is rubber band two pencils together! They will be about 8 mm apart and should work well.